The Royal River in Yarmouth is always a busy place, but recently it's been even more bustling as the marinas in the area prepare for a long-awaited federal dredging project. Falls Point Marine has been assisting the three marinas in the area — Yankee Marina & Boatyard, Royal River Marina, and Yarmouth Boatyard — as well as private individuals as they haul their moorings and docks to make way for the dredging crews. 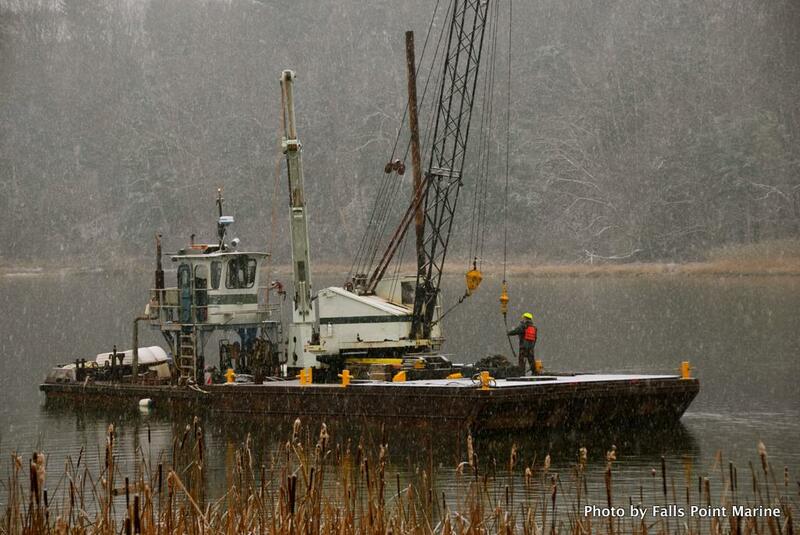 Here are a few shots from a chilly morning on the river as our crews worked in the snow and freezing drizzle to keep ahead of the Massachusetts-based dredging team and the private dredging team from Prock Marine in Rockland. Don't worry, the Falls Point Marine crew will be back in the spring to put everything back in its place and help boaters enjoy another summer on the coast!